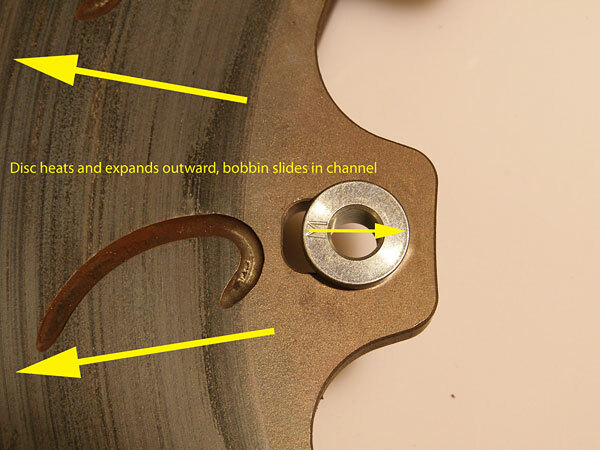 A fixed brake disc is a one piece brake disc. That is, its brake pad contact face and wheel mounting face are all part of the same piece of metal. They are relatively cheap to produce and they perform perfectly well within certain parameters, but if they are subjected to serious heat then they are unable to dilate or expand because they are not floating. 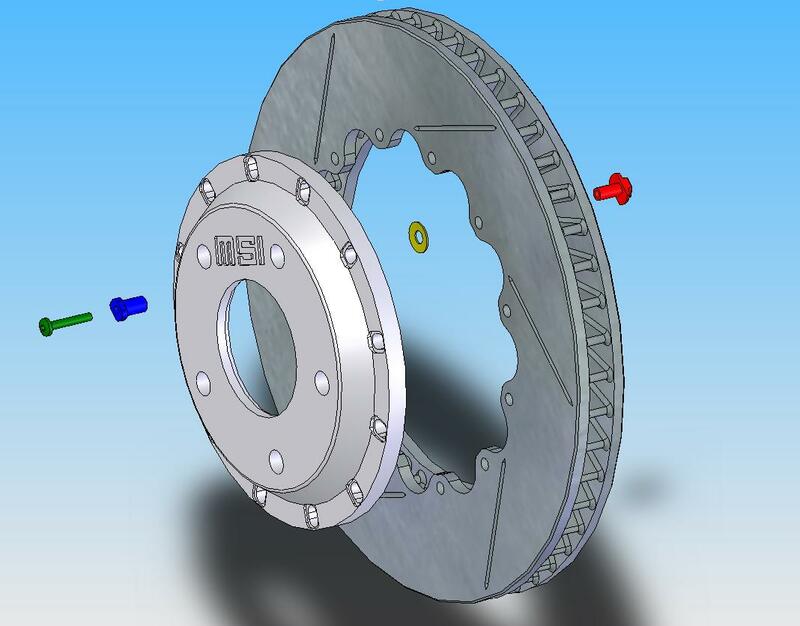 Floating brake discs (fully floating or semi-floating) are constructed in two parts. 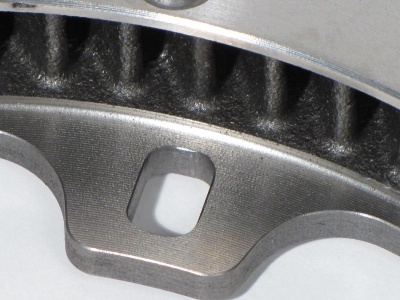 An aluminium centre part which is fixed to the motorcycle wheel and a stainless rotor part which the brake pads push on. When the rotor is subjected to serious heat it expands. By allowing it to float separately from the mounting face it is free to expand and shrink again at will without being constrained by its mounting. When this expansion takes place is does so in all directions at once and it will not be constrained. If you prevent this from happening in one direction (by fixing it on its mounting face) it has no choice but to warp, so floating discs and semi-floating discs are made in two parts to allow the discs to expand and prevent them from warping. 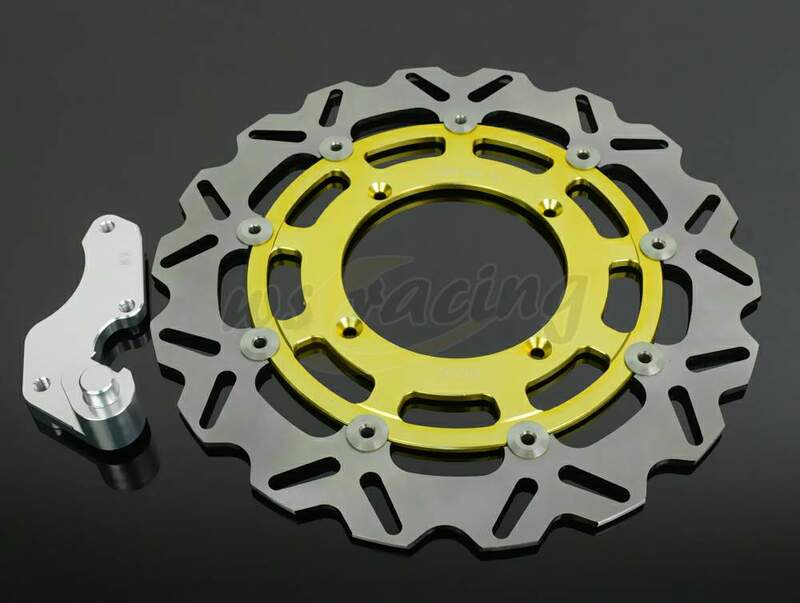 This is mainly a high performance type brake disc. Bikes of more moderate performance can use fixed brake discs perfectly happily and you will also see that most rear brake discs are fixed. This is because they don’t get used as hard and therefore subjected to as much heat. Even so, most rear brake discs are thicker than front brake discs and this is a compromise because the cooling is not as good as the front discs. They don’t get as hot but don’t cool as well either, so the thicker material helps prevent them from warping. Radial float allows differential expansion of disc and bell thus reducing stresses in the disc and minimising disc cracking and distortion. The idea of axial float is to compensate for a certain amount of stub axle / upright flex by allowing the disc to take up its ideal position within the range of float thus avoiding "knockback" of the caliper pistons. However the float should not be excessive as disc gyroscopic loads can cause the same effect that the float is trying to alleviate. The amount of axial float will depend somewhat on the application. In a "perfect" system with minimal disc movement relative to the caliper the amount of float need only be around 0.15 - 0.2mm. In most actual installations where the mountings are less than ideally rigid a float of 0.40 - 0.45mm for "float in the disc" systems and 0.20 - 0.30mm for "float in the bell" systems is more appropriate.